sailboat. : What I Wore: Wishing for the Summer - Wear Your Wardrobe 01. 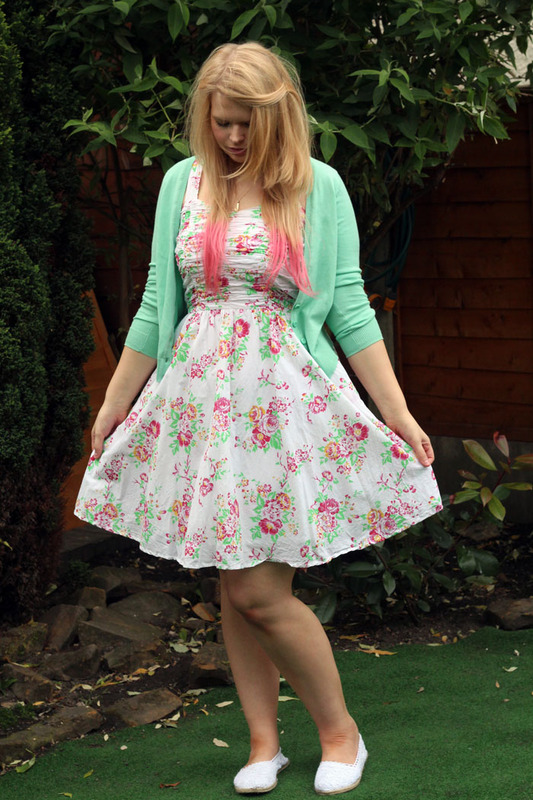 What I Wore: Wishing for the Summer - Wear Your Wardrobe 01. If you know me, then you'll know I'm always up for a challenge, especially if that challenge is one encouraging a more thrifty approach to spending. Around a week or so ago I was challenged by Voucher Codes & their lifestyle magazine Most Wanted, to purchase staple fashion items for the new season to match items that are already sitting in my wardrobe, perhaps going a little unloved and unappreciated. I was given an £80 styling budget to work with and initially the challenge was to choose three items from my wardrobe to mix and match with three new items purchased from the high street to create new & fresh outfits that were perfect for spring & summer. This was a fabulous challenge and one that has proved to me that you really don't need to go out and buy a whole new wardrobe each season, if you're a smart shopper you can transform pieces from winter to summer in a few simple steps. In order to make this challenge fit my personal spending habits a little more, I have become very frugal (some may go as far as to say tight!) with money, I picked out a few more than three items. I'm increasingly willing to invest pennies into something classic, but for the more seasonal/on trend items I'm determined to search out those bargains! The first item I immediately picked out from my existing wardrobe is actually one of my all time favourite dresses, but it has been extremely unloved for the past two summers simply because I had got a little chubbier & it didn't fit properly. In the last couple of weeks I've lost around a stone and although the dress is still a little snug, I can actually do the zip up properly now. This is the piece of clothing I'm using to judge weight loss progress by, I'm not a huge fan of relying on scales instead preferring to go by how my clothes fit me. I was the happiest I have ever been body image wise when I could wear this dress comfortably, so that's what I'm aiming for once again. I thought the best way to celebrate being able to wear one of my favourite dresses again was to find some pieces to wear with it. Cardigan: New Look♦ Dress: Jasmine Guinness Fusion for Oli. Necklace: 16th Birthday gift. Shoes: Primark. Initially I was searching for the blazers that Primark had in, but much to my disappointment I couldn't find them. Luckily a quick look around New Look solved my problems. 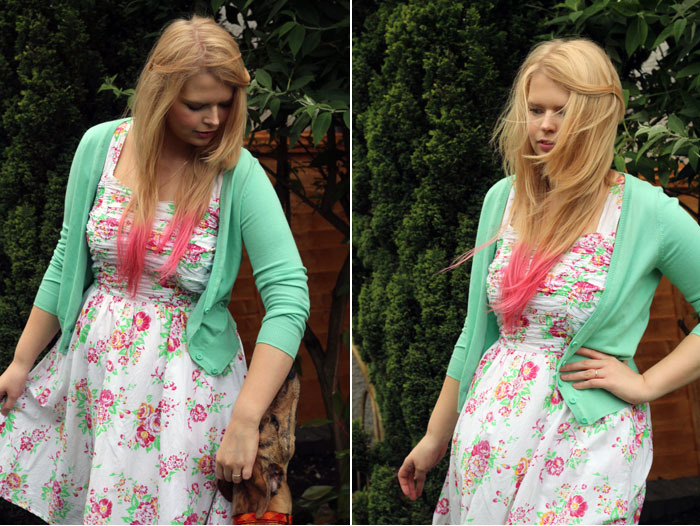 To give a more casual look to the dress I found this gorgeous mint cardigan for the bargain price of £9.99. I adore the slightly cropped length and I like to slightly roll up the sleeves to really emphasise the more casual, dressed down look I was aiming for. Paired with these super sweet Primark shoes I would totally wear this outfit for a sweet picnic in the countryside, you know, if it will ever stop raining! Incidentally, please excuse my orange feet, I'm clearly incompetent with any form of self tanner, even the gradual lotions! I actually wore this dress in my very first outfit of the day post I ever wrote here on Sailboat, almost exactly two years ago! Time flies by so quickly, and I can't believe I was writing about 25 degree summer days when right now it's currently pouring down with rain! Where did summer disappear to? Blazer: New Look♦ Dress: Jasmine Guinness Fusion for Oli. As I was heading to the till (with a grumpy boyfriend in tow, he does not appreciate shopping!) I spotted this beautiful little peach blazer and I knew it had to be mine. This is one of those blazers, that despite being such a bold colour, will go with so many pretty summer dresses sitting in my wardrobe. The cut isn't the best for my body shape, it's not very structured at all but in the warm weather I much prefer to wear loose fitting clothes, there's nothing worse than feeling hot, bothered and constricted in the sunshine! Unfortunately I can't find the exact colour on the website but I have linked the same style, I think I spotted a mint green version in store too! I kept the same shoes on here, but a sweet little pair of sandals or heels would dress this outfit up even more. One dress + two new pieces for £35 = two new summer outfits. Total bargain! How would you style a summer dress like this? 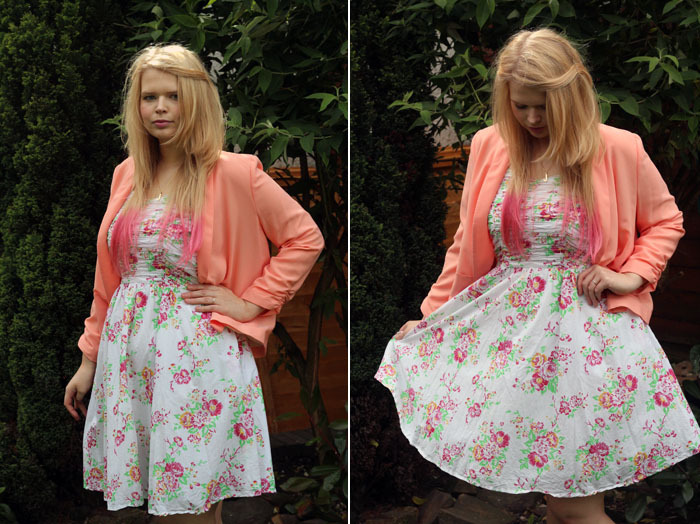 the peach blazer is lovely! 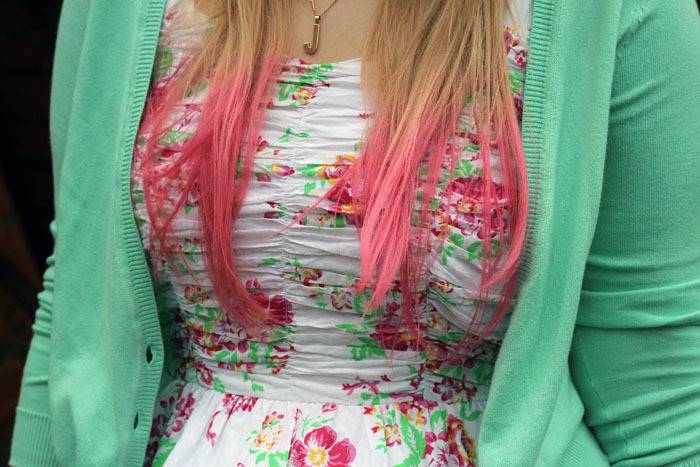 plus, i'm still completely in love with your dip dyed hair! Oh I love that dress! So much love for Jasmine Guinness. Your hair looks amazing too. That dress is looking fabulous! 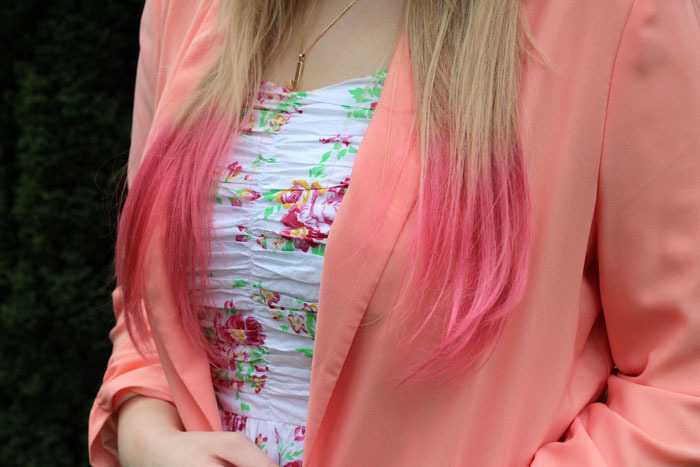 Loving the hair♥ + the blazer and the cardigan - super cute! cute dress! :) and i agree! never need to go buy a whole new wardrobe! You look amazing! And that dress is beautiful! I wish I was lucky enough to find such fantastic finds! You look lovely! I really like the peach blazer, and I LOVE your hair!